The penultimate week before the half term break has been a busy for the boys in Pentreve; with the syllabuses taught the revision process has begun in most of their subject areas. The work ethic in prep time has been good and the boys have continued to make the most of the range of facilities that the SBASC offers in the evenings. Striking a balance of working hard and having some down time is a skill these boys are developing well. Henry, Rowan, Will and Fabian spent the day at Carn Brea on Tuesday, representing the school on the athletics track in the ESAA Boys Track and Field Cup. It really is great to see our boys taking full advantage of the extracurricular activities that the school offers. We also welcomed a familiar face in Callum back to the house on Wednesday after his Cricket match against Penrice, it was, as it always is, a pleasure to have Callum in the house and we hope to see him again soon. Friday quickly came about, and with the weather good after school it was great to see the outside space being made use of. Rowan and Alec battled it out on the table tennis table straight afterschool and then the Mulready children coaxed the boys to the garden for some football action. Poppy, Matilda and Bella spent a good hour playing ‘foot’ ball with Harry, Cyrus and Alec before supper which was a real treat. 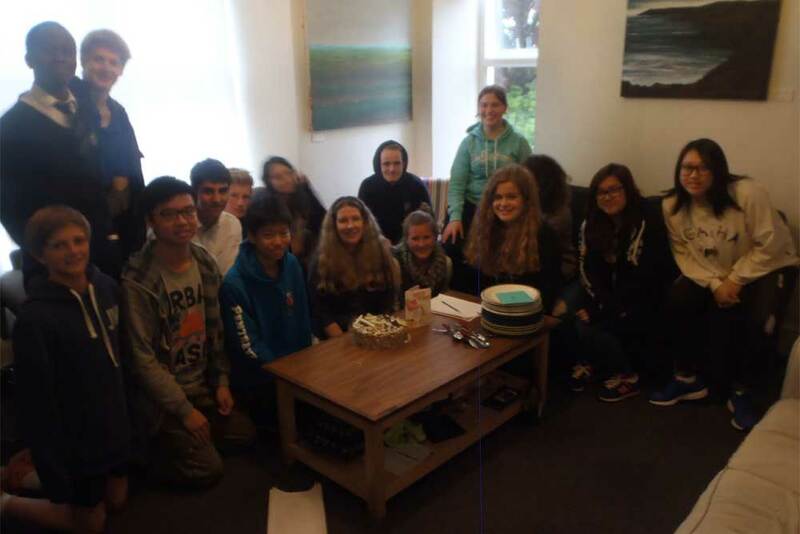 After a hearty hotpot supper it was time for Mrs de Gruchy’s extra English lesson… and we had a birthday treat in store for her. The candles were lit on the BIGGEST and CHOCOLATIEST cake I have ever seen and the boys and girls sang happy birthday, almost tunefully. Dedicated as ever to the cause, the lesson continued until the temptation was too much to bare and the cake had to be devoured. I really enjoyed sitting in on some of this week’s English lesson where the boys and girls divided into two groups and made up questions for the opposite gendered team, questions that they didn’t think the other team would know the answer too. Who won? The boys!!! I am pleased to report that are boys are indeed in touch with their feminine side, Ayobami’s belief that girls go to the bathroom in two’s in order to pray is a little worrying though! Saturday was to be a free day for all, some used the time to revise, the house facilities were enjoyed, town was visited and the boys generally hung out and relaxed. With the sun still shinning we fired up the BBQ after supper and the boys, joined by Bryony and Lina from Poltisco, dutifully wolfed down the mound of sausages, burgers and chicken wings cooked by Mr Mulready. Table tennis was played until it was too dark to see the ball and the boys then retreated to the common room for a DVD. On Sunday the boys made the most of their lie-ins and then made their way up to brunch. 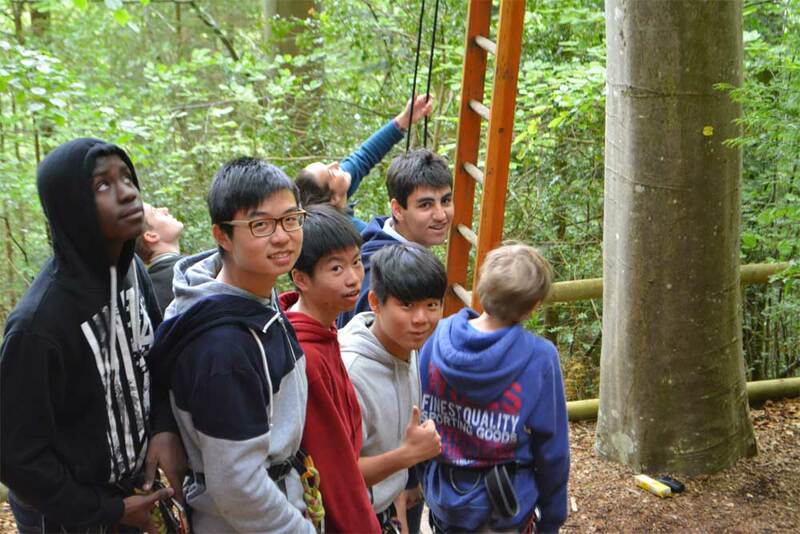 After eating we piled onto the minibus and set off for the weekend’s main activity, Tree Surfing….three hours of fun in the high ropes courses at the Tamar Trails in Tavistock. The boys were talked through the key health and safety points, taught how to navigate the ropes and then off they went. Their nerves were tested on the leaps of faith, cargo nets were climbed and a lot of fun was had, between the finger nail biting that is! We returned just in time for a supper of spicy chicken or BBQ pork and the boys, having worked up an appetite didn’t need to be asked twice. It was then back to the house for some homework/revision. The usual rounds of laundry sorting, bag packing and room tidying also ensued and the boys went to bed having had an active and wholesome outdoorsy type day! With the half term break now just five days away I will take this opportunity to wish the boys a happy and productive half term holiday. There is a lot of work to be done but I hope the boys find some time to rest and recuperate too. Mr Nicholas and I look forward to welcoming them back fully revised, exam ready and raring to go on Sunday 31st May. Once the exams are out of the way the boys will, I am sure, enjoy what the Summer term has to offer with sports days, world aims week, boarders camp and speech day just a few of the highlights.